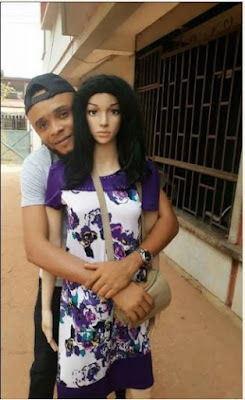 In a bid to join the trending s*x doll discussion, a Nigerian guy was all smiles as he posed with a female mannequin whom he "proposed" to. 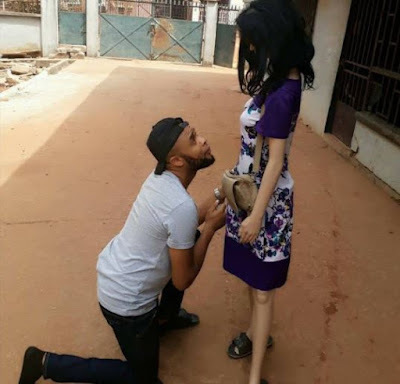 According to the young man, he proposed to his "s*x doll" and 'she' gave him no reply. The pictures were shared online with comparison between Nigerian ladies and "free-minded" s*x dolls who give guys less problems. Well this has been described as another publicity stunt by the man to seek attention and tease Nigerian ladies who are irritated by the s*x doll issue.